The certification and endorsement of our Quality system by SAI Global verifies that we are committed to quality and the processes leading to it. It is an ongoing and evolutionary process and we will constantly strive to refine, improve and develop each and every part of the system on a continual basis to provide a reliable product and service that our customers can depend on. 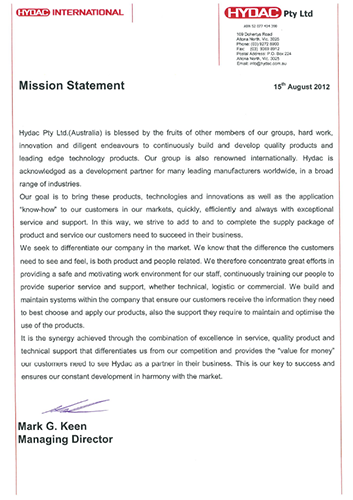 HYDAC Pty Ltd.(Australia) is blessed by the fruits of other members of our groups, hard work, innovation and diligent endeavours to continuously build and develop quality products and leading edge technology products. Our group is also renowned internationally. HYDAC is acknowledged as a development partner for many leading manufacturers worldwide, in a broad range of industries. HYDAC Pty Ltd.(Australia) is continually upgrading its products and services with the help of its Integrated Management System. The processes it contains are constantly being revised to take account of the demands of HYDAC’s customers and regulatory bodies, as well as changes to its internal organisation. 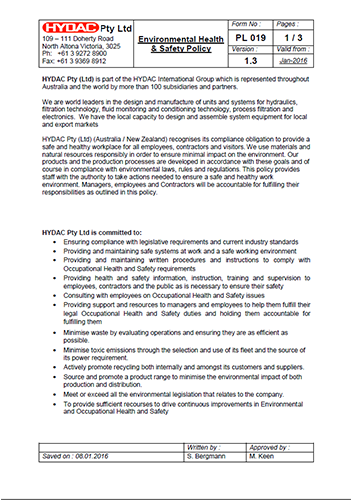 HYDAC Pty Ltd.(Australia) recognises its compliance obligation to provide a safe and healthy workplace for all employees, contractors and visitors. We use materials and natural resources responsibly in order to ensure minimal impact on the environment. Our products and the production processes are developed in accordance with these goals and of course in compliance with environmental laws, rules and regulations. 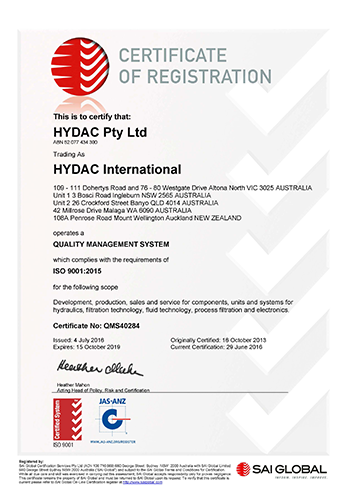 HYDAC Pty Ltd.(Australia) is one of the first companies in the Hydraulic Industry in Australia to be certified under the new 2015 edition. The 2015 edition is a major change as it required significant implementation of new systems & procedures with new considerations. TUV CERT Certifies HYDAC Group Insdustriegebiet D-66280 Sulzbach for establishing and applying a quality management system for development, production, sales and service for components, units and system for hydraulics, filtration technology, fluid technology, process filtration, and electronics. 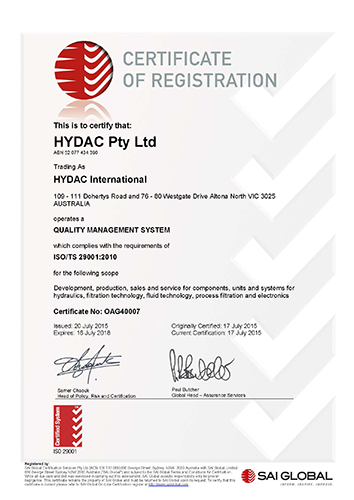 HYDAC Pty Ltd.(Australia) operated an occupational health & safety management system for the following scope: development, production, sales and services for components, units and systems for hydraulics, filtration technology, fluid technology, process filtration and electronics. TUV CERT Certifies HYDAC Group D-66280 Sulzbach for establishing and applying an environmental management system for development, production, sales and service for components, units, and system for hydraulics, filtration technology, fluid technology, process filtration, and electronics. HYDAC Pty Ltd.(Australia) operated an environmental management system for the following scope: development, production, sales and services for components, units and systems for hydraulics, filtration technology, fluid technology, process filtration and electronics. TUV CERT Certifies HYDAC Group D-66280 Sulzbach for establishing and applying an environmental management system for development, production, sales and service for components, units and system for hydraulics, filtration technology, fluid technology, process filtration and electronics.